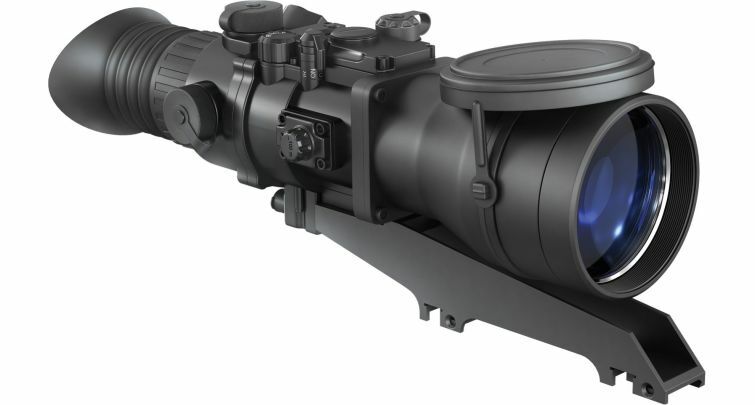 Pulsar Phantom Night Vision Riflescope 3x50 is a top-quality, military-grade Night Vision scope from Pulsar, made to meet all the requirements of a Rifle Scopemade for modern night hunting. No target will elude you when you mount this versatile night hunting gun scope to your hunting rifle. Utilizing a military-style design and offering maximum functionality, the Phantom Nightvision Rifle Scope is an obvious choice for any hunter and outdoorsman who demands the high quality and impeccable reliability found in Pulsar Night Vision products. The Pulsar Phantom Night Scope is a fully weatherproof night vision scope, thanks to a nitrogen filled optical channel and waterproofing to IPX6, and can be used anywhere. Arctic ice fields or desert sands, humid tropical forests or harsh Siberian tundra - the Pulsar Phantom Scope is ready to do its job regardless of weather conditions. The body of the Phantom is made of highly durable glass-filled plastic. The bodyshell design and high grade intensifier tubes ensure shockproofing to heavy calibers of rifle fire, including 9.3x62, 9.3x74 and 375 H&H. The Gen 2 night vision tube has Automatic Brightness Control (ABC) and, coupled with the high quality, wide-aperture lens, provides a sharp and clear picture. The high light gain, combined with the built-in infrared light, allows hunting even in situations of critically low night illumination (down to 10-4 lx - overcast starlight). The Phantom 3x50 Rifle Scope features a fast start-up function, letting you make quick assessments when needed. The night sight is active only when you press the power button. The Pulsar Phantom 3x50 Night Vision Scope lets you choose the most suitable target reticle configuration and change it by simply pressing a button. The voltage stabilization system eliminates reticle shift even with an almost discharged battery. All main controls are on top of the rifle scope body for easy access. Resolution: 45 lines per mm, min.